While waiting for Hitoe Sushi to open for dinner, I decided to venture once again into UBC. I needed to get a small snack to keep me alive for the next two hours, so I thought I would get something small at one of the many fast food joints on campus. Unfortunately, fast food is way more popular at UBC than it is anywhere else in the Lower Mainland. At every Starbucks, Tim Hortons, White Spot, etc., there was a massive line-up that either went all the way to the door or beyond. 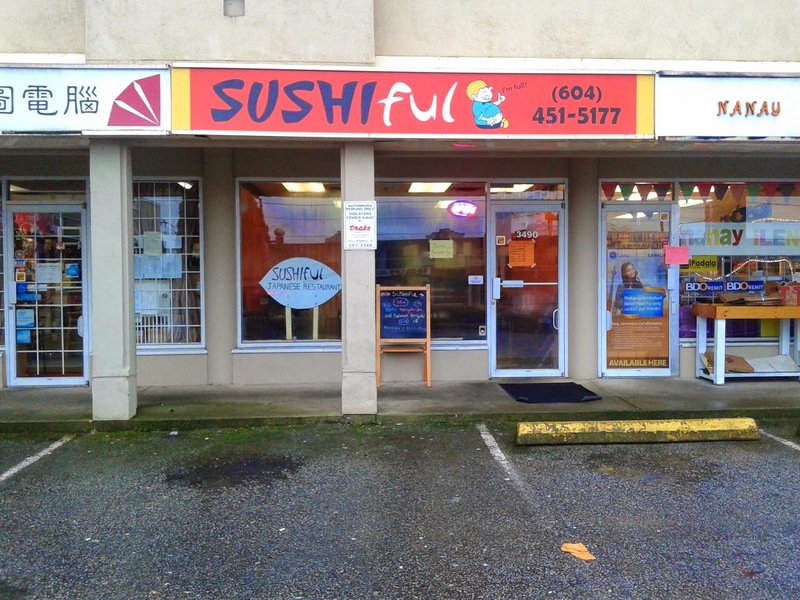 Come on, people, eat less junk food and eat more sushi! 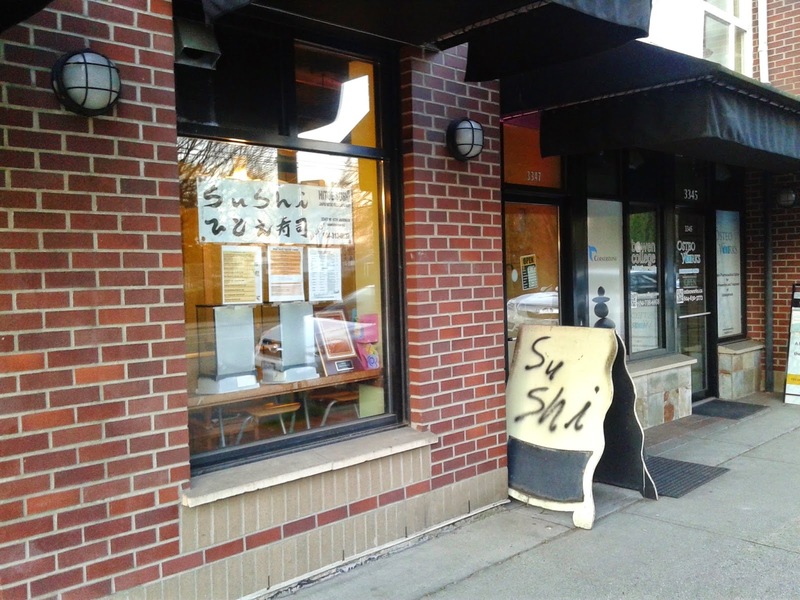 The restaurant has a very modest exterior. Their name, "Hitoe", is written in small letters on a piece of paper taped to the window (although their Japanese name, ひとえ, appears in a bigger font). Inside, the decor is also modest, but all of the staff were wearing Japanese outfits. Also, there is a large variety of Japanese-themed decorations to make the place feel more Japanese-themed. This is all fitting because Hitoe is actually run by Japanese people. When I opened the menu, the first thing that stood out to me was the large number of gluten-free items. The next thing I noticed was that the font was really small, but since I am a university student, that didn't bother me much. 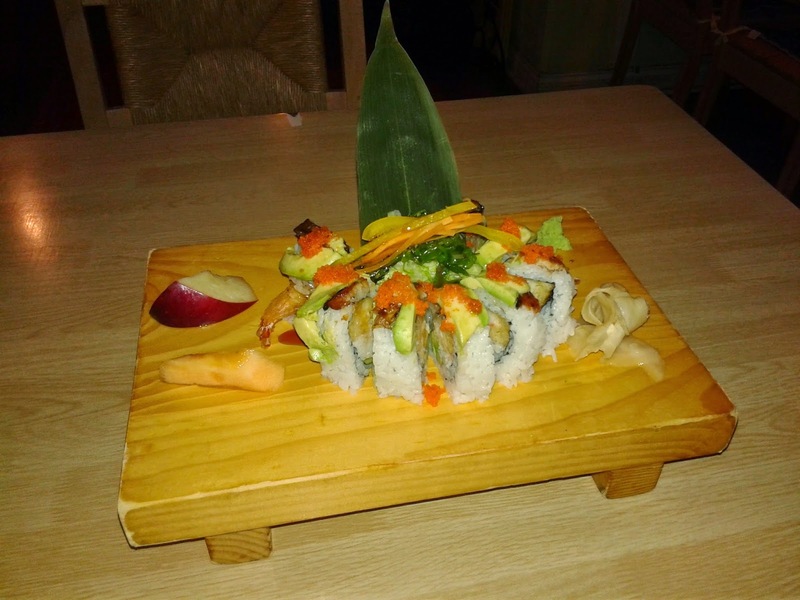 The EEEEEEELLL Roll (yes it's spelled like that) consisted of tempura ebi, cucumber, crab meet, BBQ eel, avocado, masago, teriyaki sauce, olive oil and mayonnaise. It was a generous portion with 10 pieces presented neatly in a circle around a small seaweed salad. The seaweed salad was my favourite part of the whole dish. 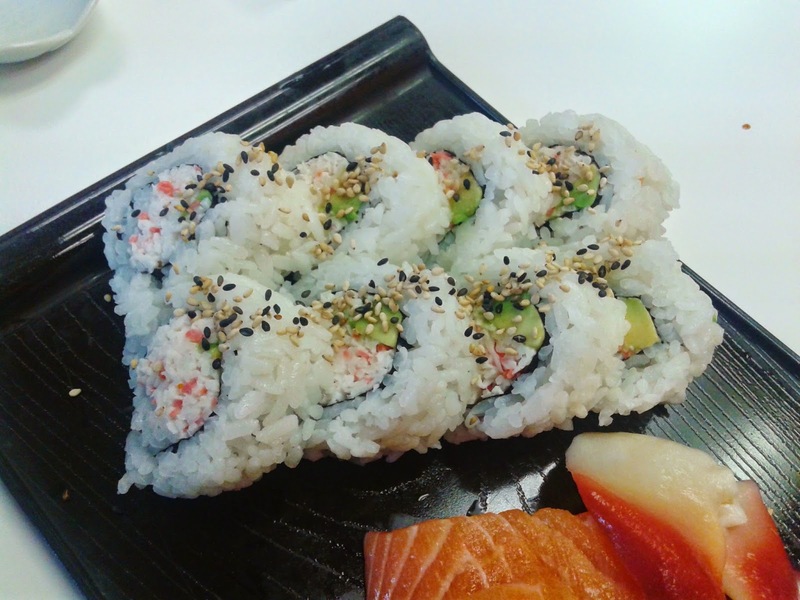 Regarding the roll itself, the unagi had a nice sweet flavour, but this was masked by the bland avocado and the overuse of vinegar in the sushi rice. 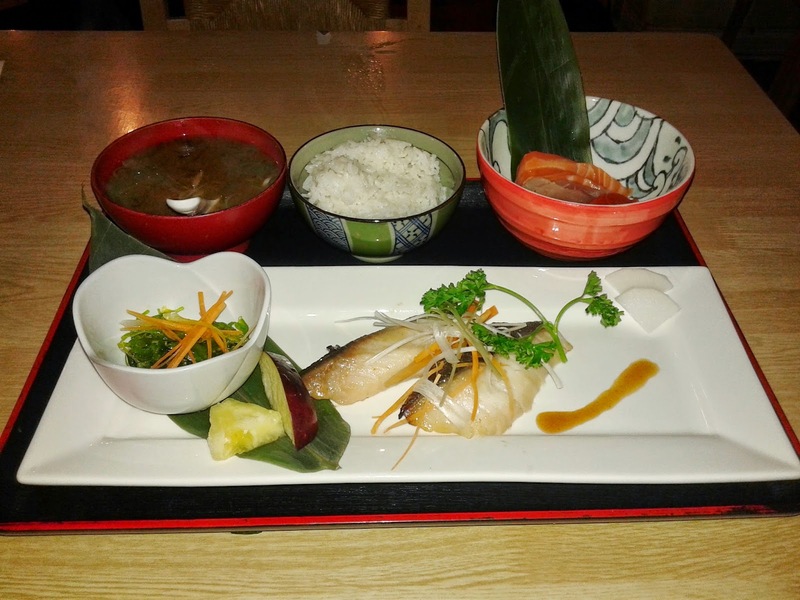 Next, I had the Black Cod Set Meal (BBQ miso-flavoured black cod, steamed rice, takuwan, seaweed salad, appetizer sashimi, miso soup) pictured above. 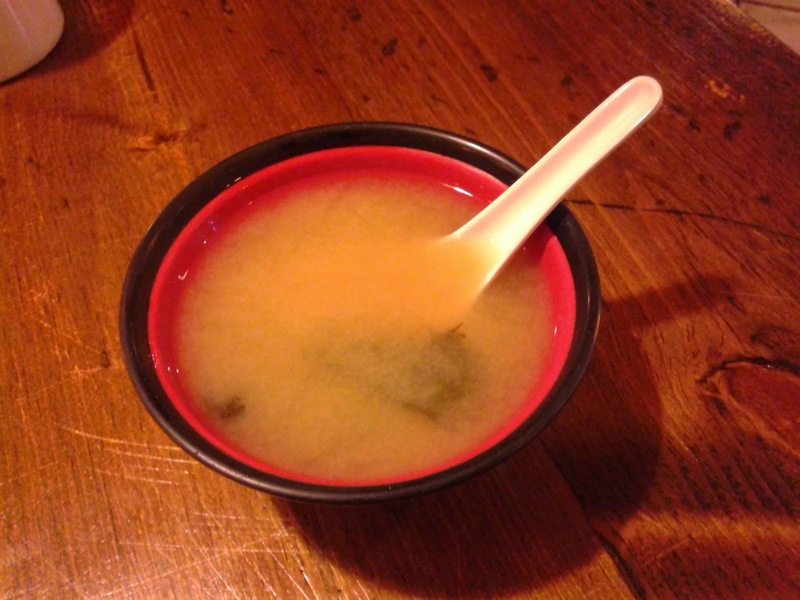 The Miso Soup was made with a dark miso paste, giving it a uniquely rich flavour. 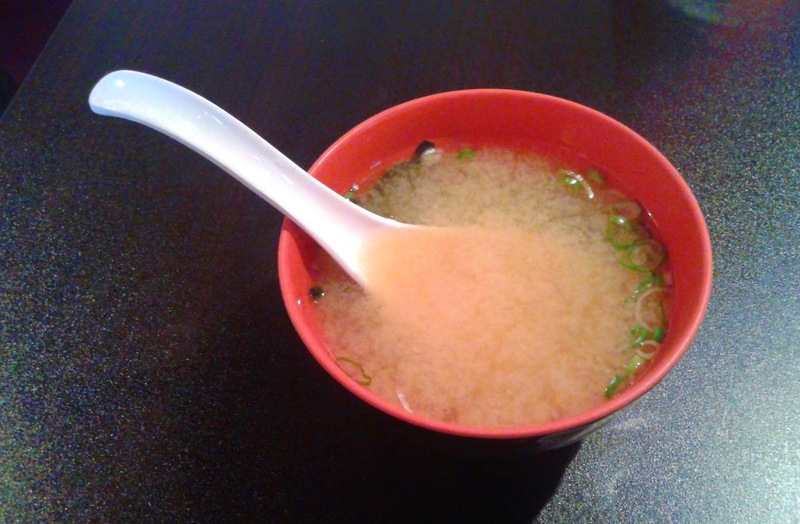 It certainly doesn't taste like your average miso soup, and there is an abundance of seaweed and tofu too. 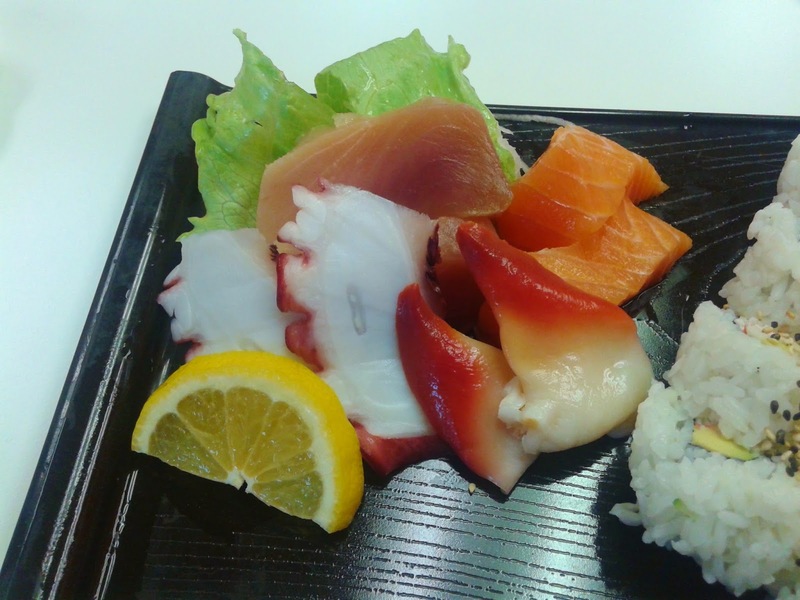 The Appetizer Sashimi did not come in big portions, but it certainly fulfilled the freshness criteria. 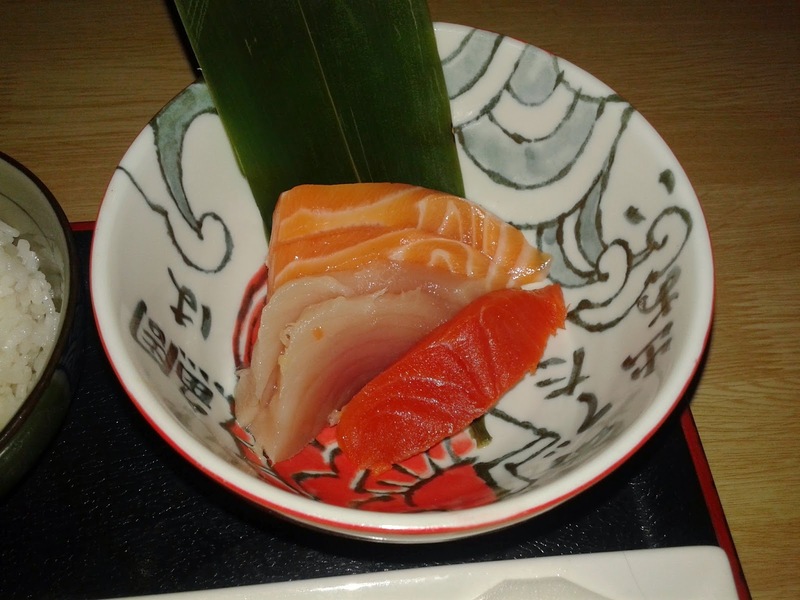 The Salmon Sashimi had a decent texture with just enough flavour. The Tuna Sashimi was especially soft and with a nice balanced taste. 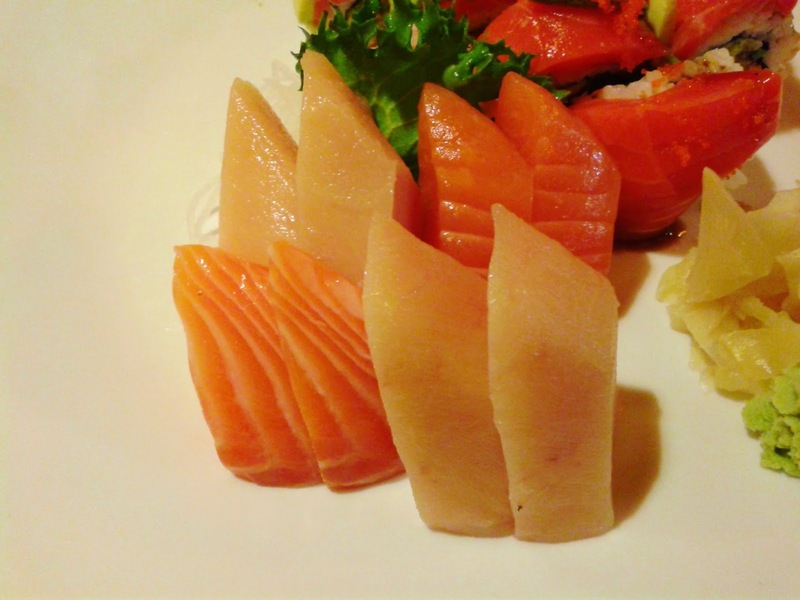 The Sockeye Salmon Sashimi was just a smooth texture away from an A. 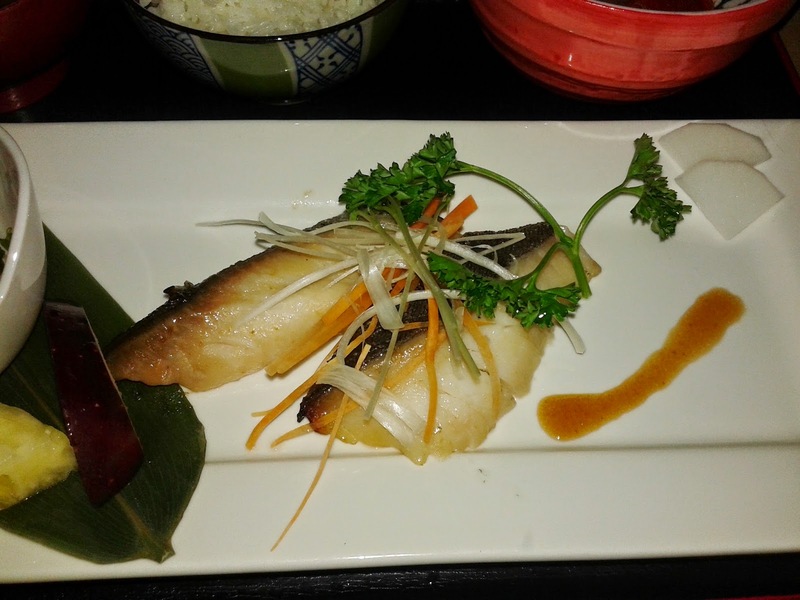 The BBQ Miso-Flavoured Black Cod was very soft and exhibited good moisture preservation. 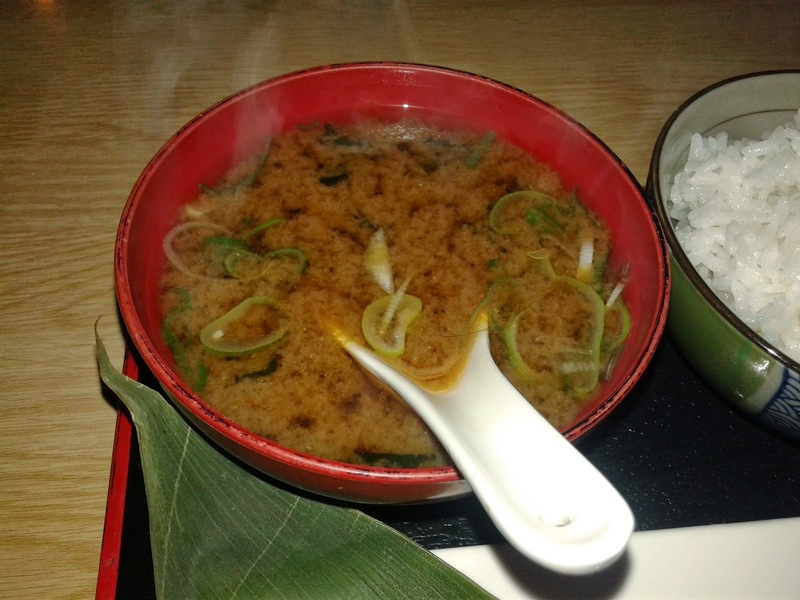 The unique sweetness from the miso was quite enjoyable, though it could have more of a BBQ flavour. The servers were especially friendly during my visit and even presented me with a packet of Pocky sticks on my way out! 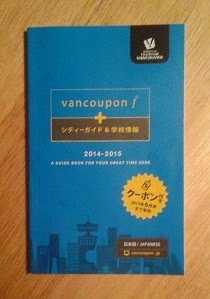 The prices were reasonable considering the location and if you like authenticity, then Hitoe can fulfill that. The place even has that "authentic smell" as you pass by it. However, it doesn't necessarily have a fancy atmosphere and the lighting can be improved. 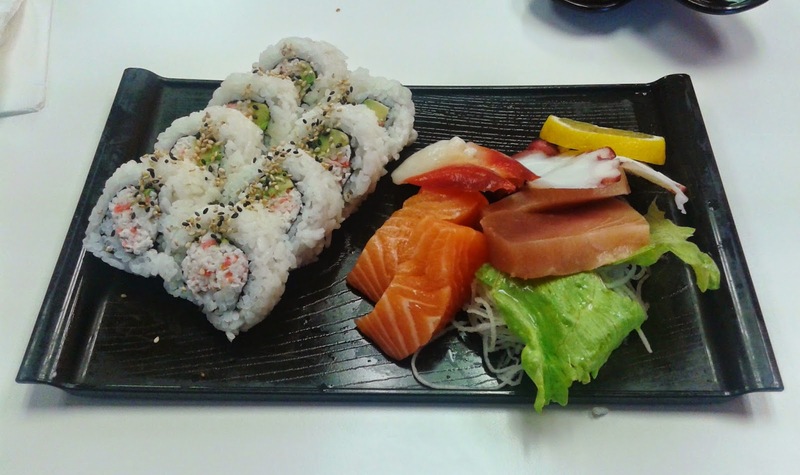 In my opinion, the food was slightly above average, and it was a bit of a shame that I was too full to try their aburi nigiri. After finishing another daunting week of lectures, I was seeking some Aburi awesomeness when I suddenly remembered that Dine Out was still available. It was 2:30 p.m. and the only sushi restaurants I knew that served a Dine Out Lunch Menu were Miku and Minami. Of course, I ended up choosing Minami just so I could write one more episode. Don't worry, I got my priorities straight. 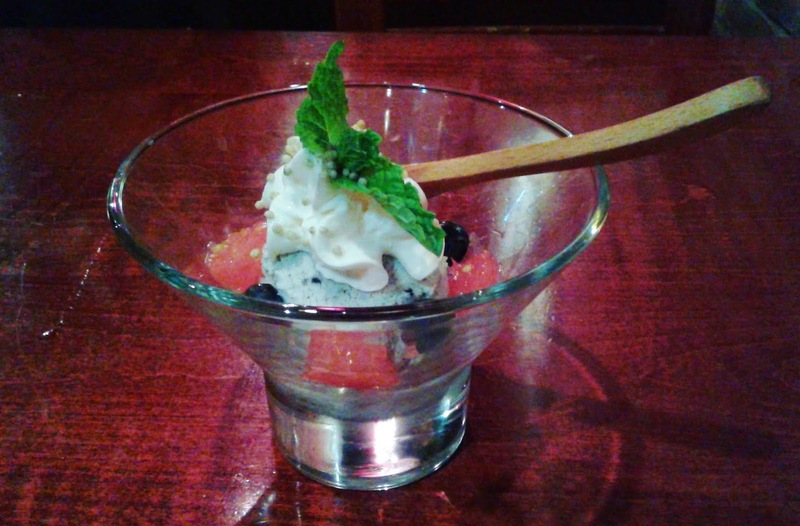 Both Minami and Miku are operated by the Japanese restaurateur Seigo Nakamura and specialize in modern Japanese fusion cuisine. 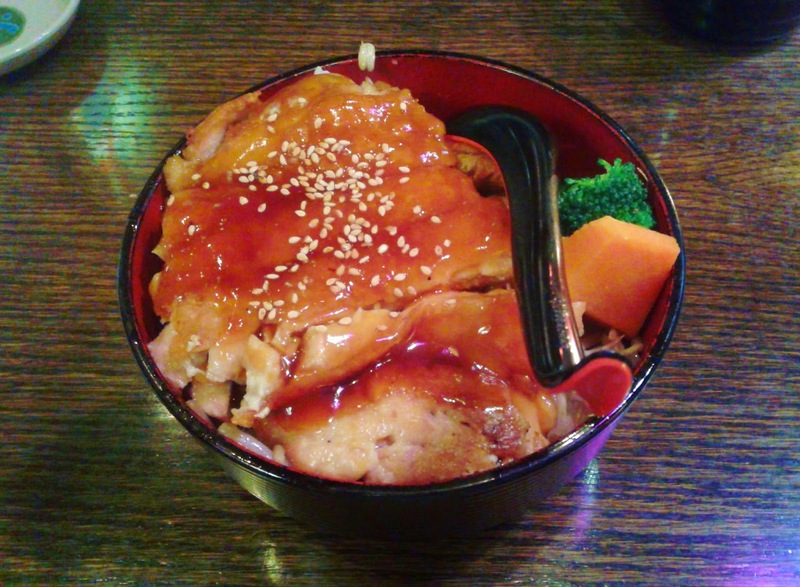 Minami has a more Pacific Western influence than Miku but many of the best-selling items can be found at both restaurants. Minami, located in the heart of Yaletown, does not have the stunning view that Miku has to offer, but the interior atmosphere is cozier and more comfortable in my opinion. Most importantly, I have never had the problem of Minami running out of mint chocolates at the door. 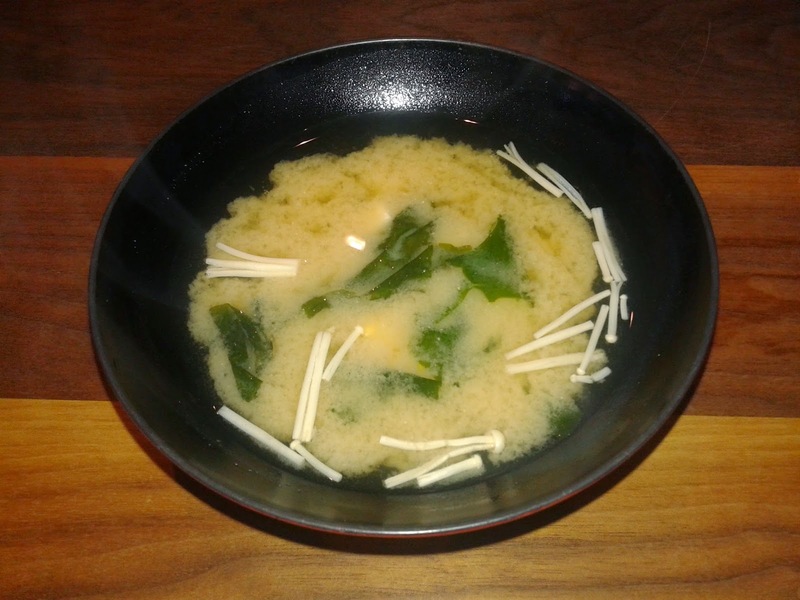 My Dine Out Lunch started off with the Miso Soup, which was garnished with seaweed, tofu and enoki mushrooms. The miso paste was leaning towards the stronger side and it tasted quite standard except for the addition of the mushrooms. Before I could finish the Miso Soup, the Zen box and Specialty Sushi arrived at the same time and were quickly followed by the Ebi Fritter, which I ordered in addition to the Dine Out Lunch Menu. I'm not quite sure why they thought it was a good idea to bring out everything at virtually the same time, but at least I was seated at a table of 4 so I had enough room on the table for everything. 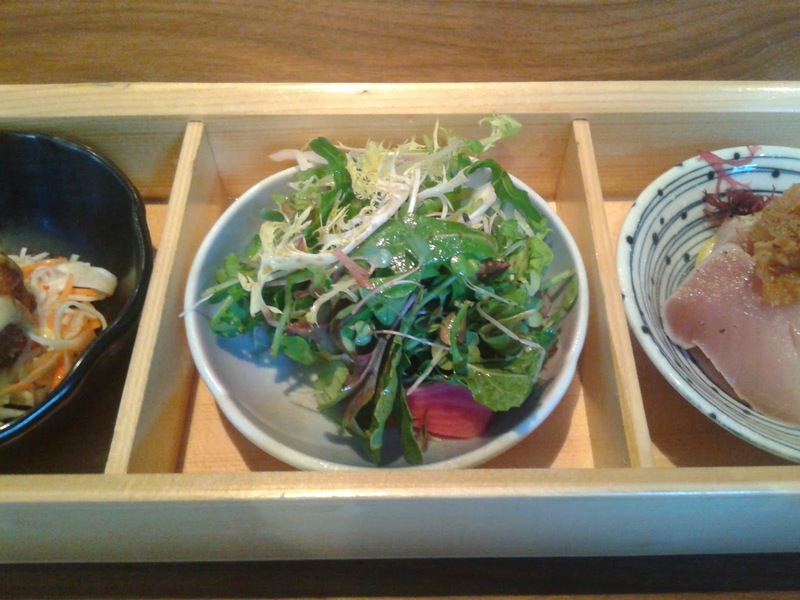 As the Zen box is designed to be eaten from right to left, I started with the Aburi Bincho (seared white tuna), which was accompanied by red seaweed and ponzu-oroshi sauce. 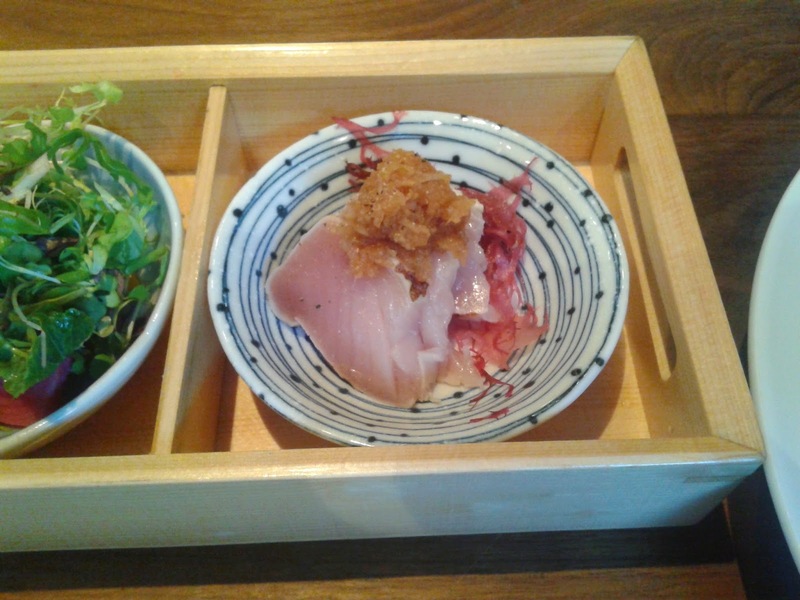 It was similar to a tuna tataki and could use a bit more moisture, but the tuna was quite fresh. The Beet Salad consisted of roasted and pickled beets, maple-apple cider vinaigrette, and baby greens. The vinaigrette had a citrusy flavour and the beets were roasted for the right amount of time, allowing them to retain a mild amount of juiciness and a mild fruity flavour. The vinaigrette could be better integrated with the baby greens. 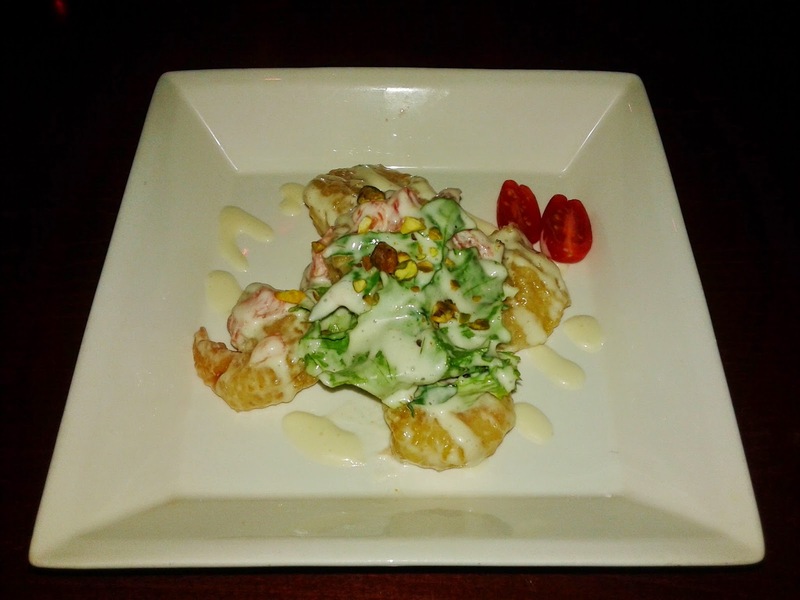 The Tiger Prawn Cake was accompanied by an Asian slaw and sweet chili aioli. 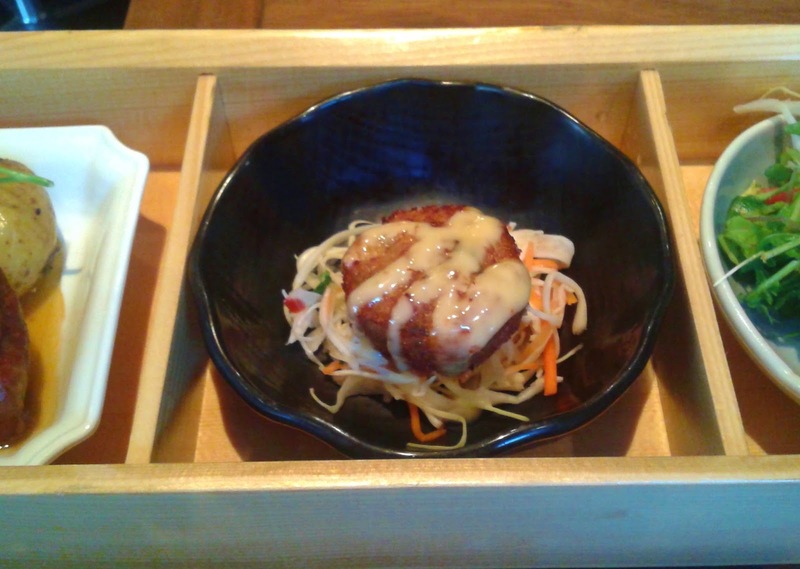 The coleslaw had an appealing mild level of spice, and the Tiger Prawn Cake had a Chinese fried meatball feel to it. 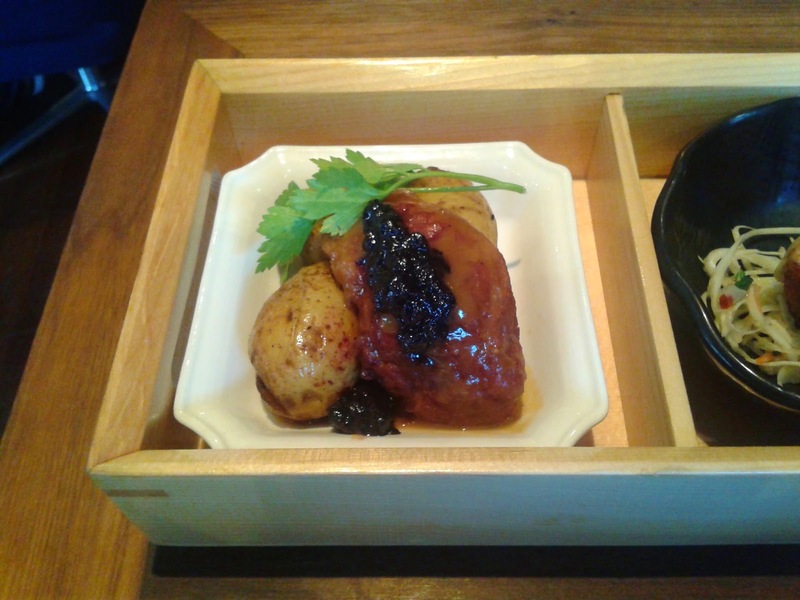 The Fraser Valley Pork Cheek was served with roasted heirloom potatoes, maple-miso sauce, and juniper-blueberry compote. The potatoes were soft, but a bit dry by the time I got to them. However, the pork cheek was perfectly braised, and was delightfully juicy and surprisingly soft. It certainly tasted better than it looked. The blueberry compote added a subtle sweetness to the pork cheek that worked excellently. 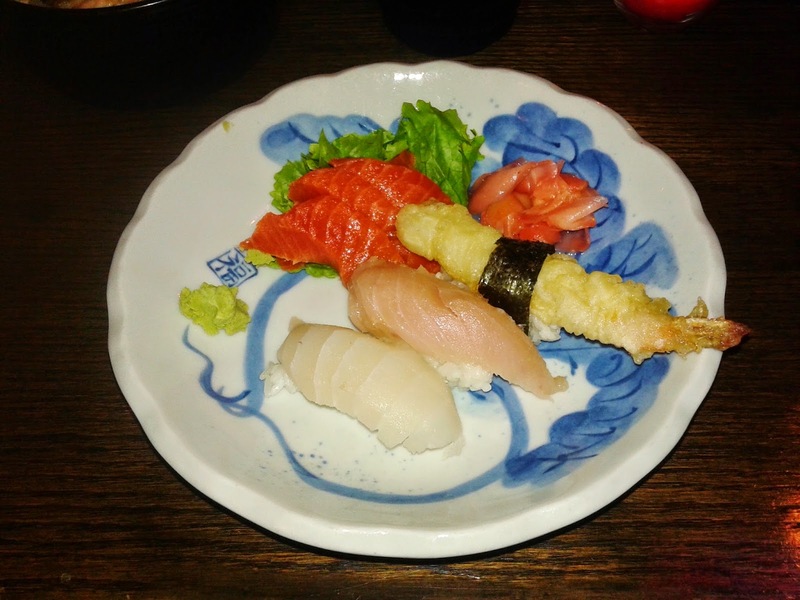 The Specialty Sushi came with two pieces of dressed nigiri sushi, one piece of maki sushi and two pieces of Aburi (seared) oshizushi. The Hamachi with Citrus Avocado was fresh, but the citrus avocado kind of vanished when consumed with the hamachi. 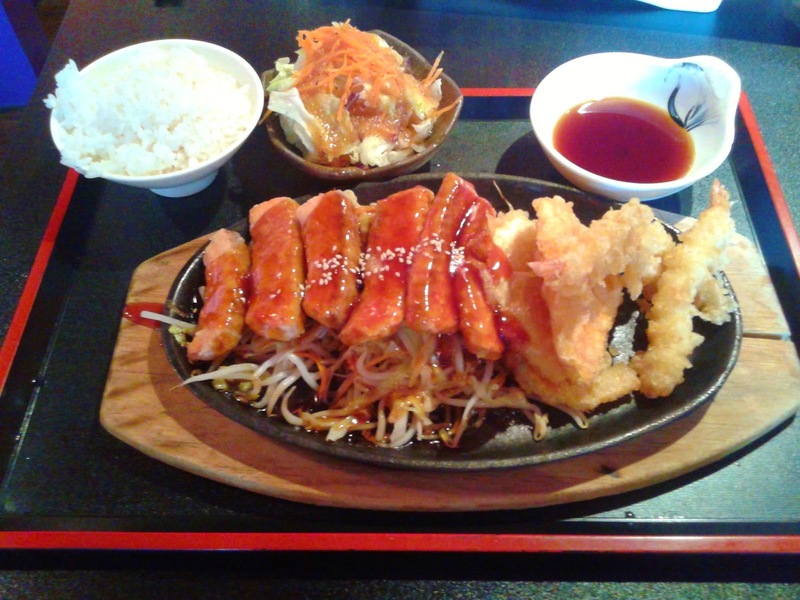 On the other hand, the miso glaze accentuated the flavours successfully in the Albacore with Miso Glaze. 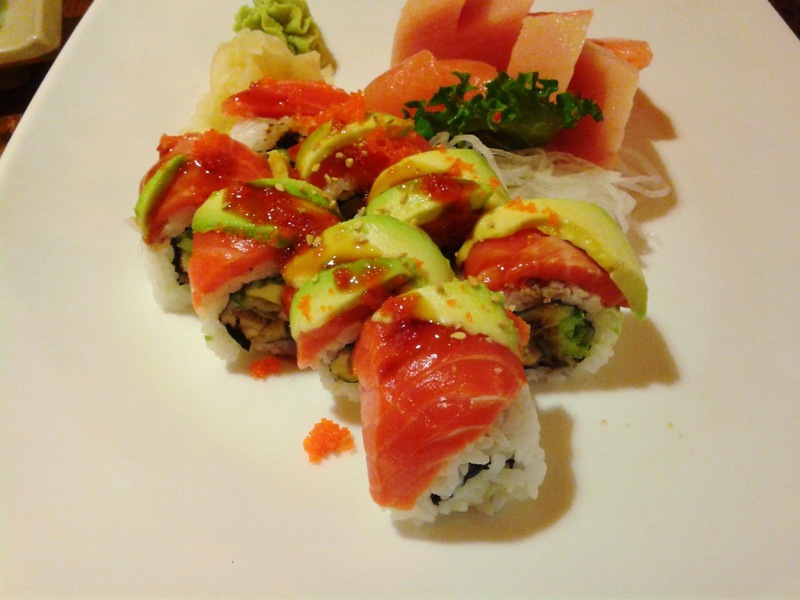 The Minami Roll consisted of spicy prawn, cucumber, Aburi short rib and wasabi masatake sauce. The short rib was soft and had a nice, smooth texture, while the cucumber took center stage with regard to the interior. 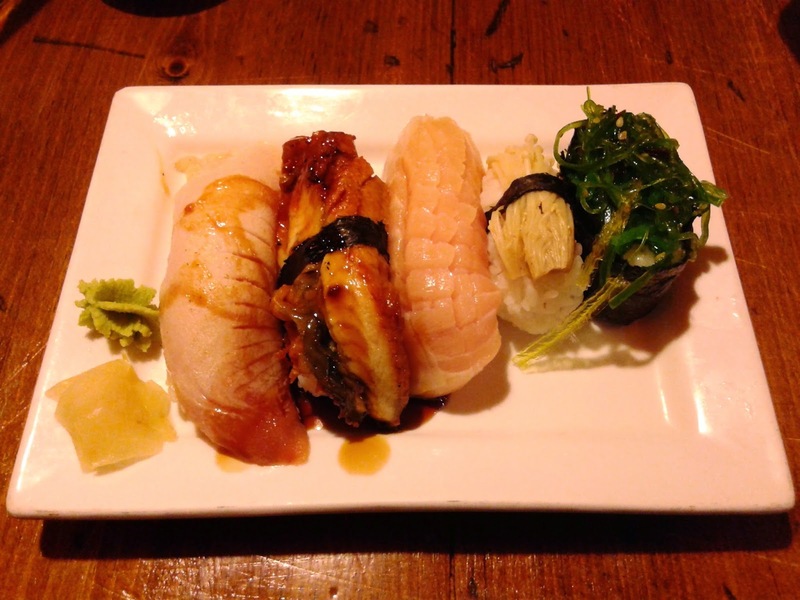 When I wrote Episode 59, I didn't really think Miku's Aburi Salmon Oshi would be topped, but it was. Whereas Miku's Aburi Salmon Oshi was 95% there, Minami's was 100%. It had the perfect smoky flavour and peppery tinge, and was slightly more aromatic than Miku's. Minami completely nailed this one. 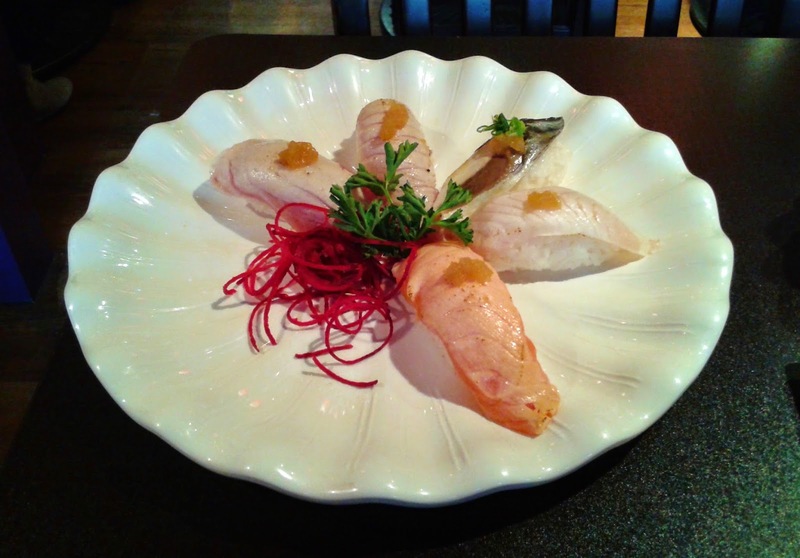 The Aburi Ebi Oshi was dressed with a creamy, lemony pesto sauce and the sushi rice that accompanied it was very soft. 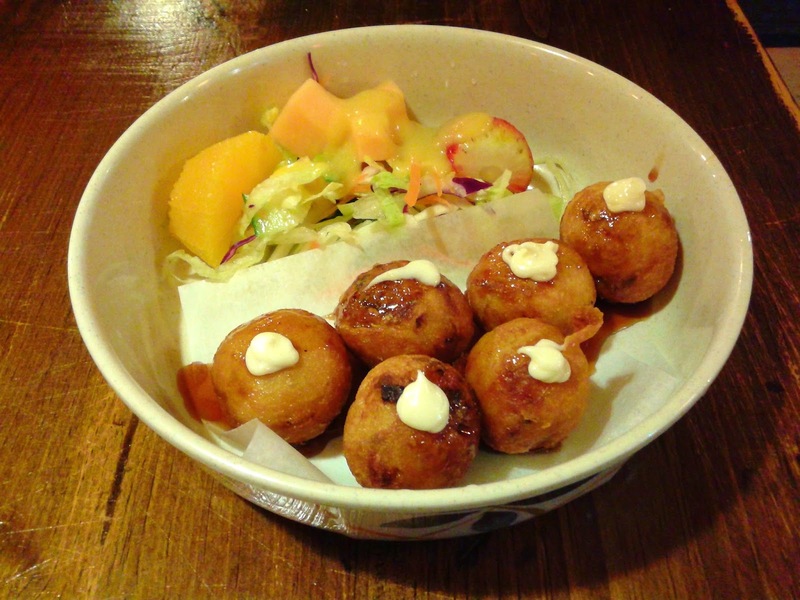 The Ebi Fritter came with 5 large, meaty prawns covered in a light, crispy batter. The spices and herbs used in the batter gave it an extra dimension of flavour. The prawns needed slightly more moisture and significantly more balsamic reduction. Minami completely blew me away with this dish during my last visit, so I'm not too sure what happened here. 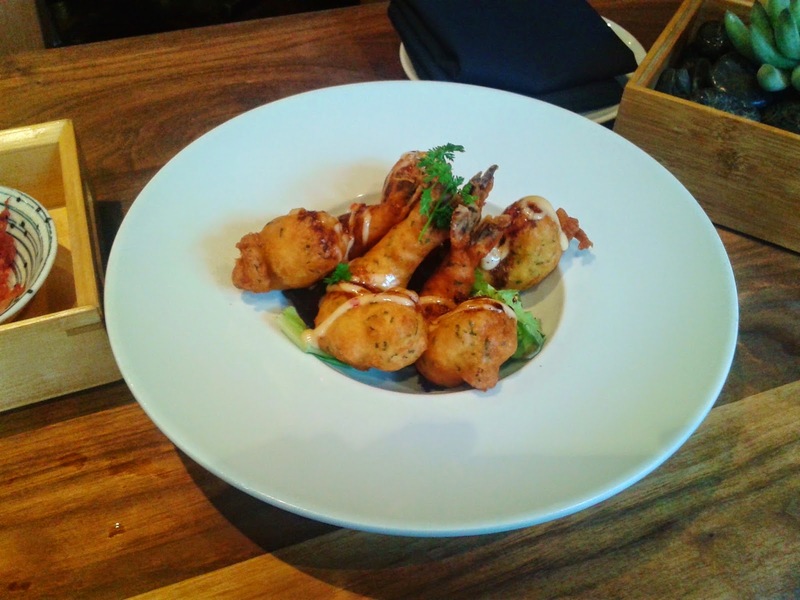 It was still an above average dish of battered tiger prawns though. The dessert for the Dine Out Lunch Menu came in the form of a Passionfruit Sorbet with a lemon cookie and seasonal fruit. I'm glad that they didn't bring this out before I finished all the dishes above. 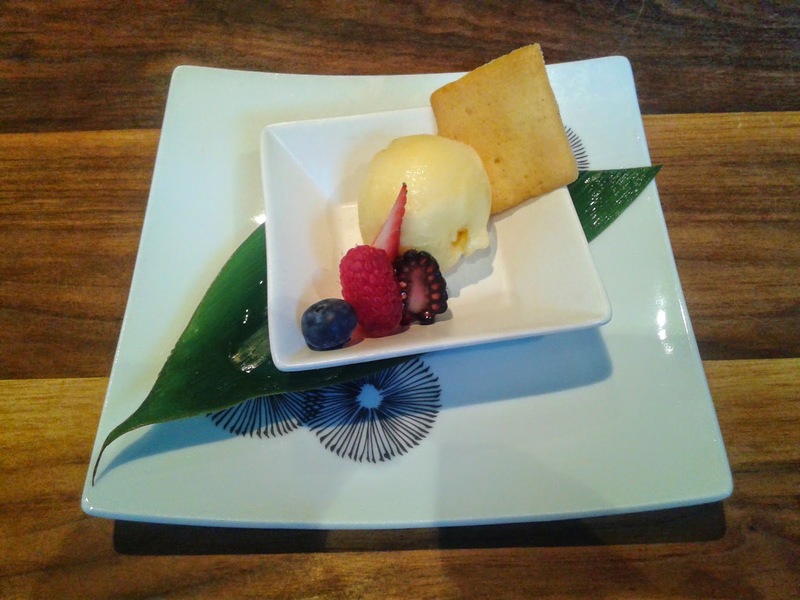 The sorbet had a bright, citrusy flavour with a sweet tang and went well with the fruits. It was a nice, refreshing finish to a decent set lunch. 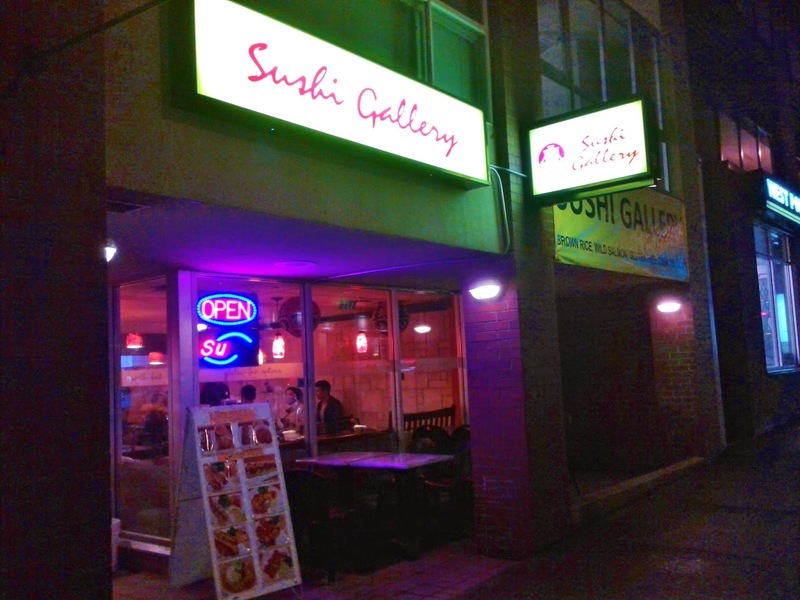 The service was attentive, friendly and a notch above your typical Japanese restaurant. Like Miku, they took the time to introduce each item to me. However, I felt that some things could be improved as the timing of the dishes was off and they were conducting an interview in the table next to mine. 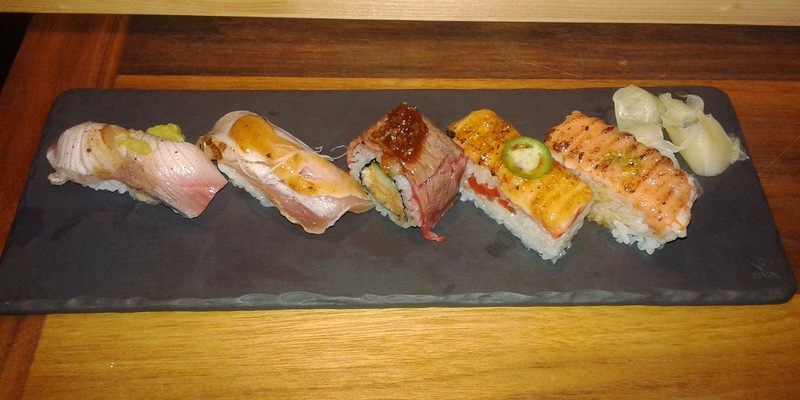 At the very least, I got the chance to savour some very memorable items, such as the 10/10 Aburi Salmon Oshi (which I want to give an A++) and the surprisingly good Fraser Valley Pork Cheek. 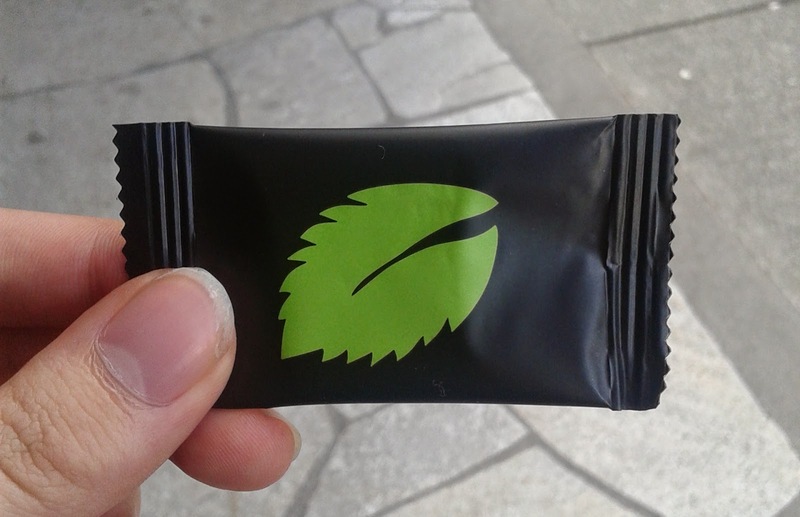 The best part of all was that the chocolate container by the door was completely packed with mint chocolates, so I delightfully grabbed one as I left. Score!